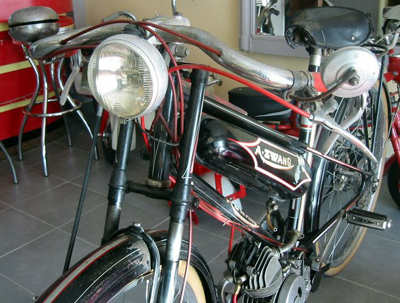 This Zwang is powered by a top-of-the-range Cucciolo 48cc engine. 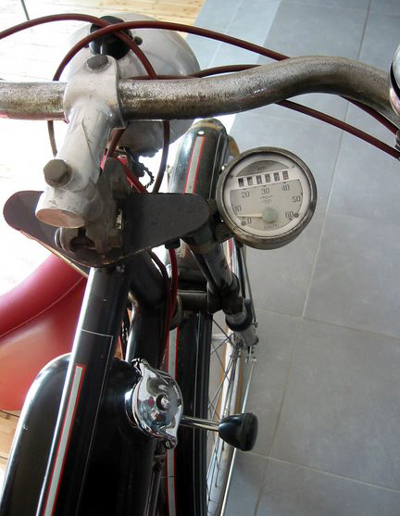 In Italian cucciolo means ‘Little Puppy’ and this early 4-stroke bicycle auxiliary engine is one of the earliest Ducati models …from the days before Ducati made complete motorcycles! 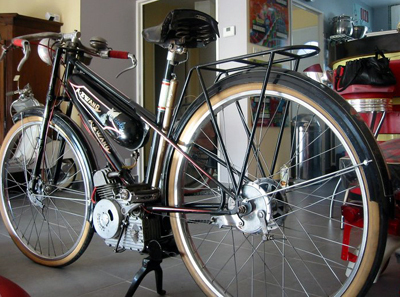 Whereas, in Great Britain, bicycles and cyclemotors (or mopeds) were manufactured for the masses and sold on the basis of their competitive prices, in France, since the twenties, there had also been a market for extremely upmarket ‘fashionable’ cyclemotors. Their selling point? – Exclusivity and their high prices. 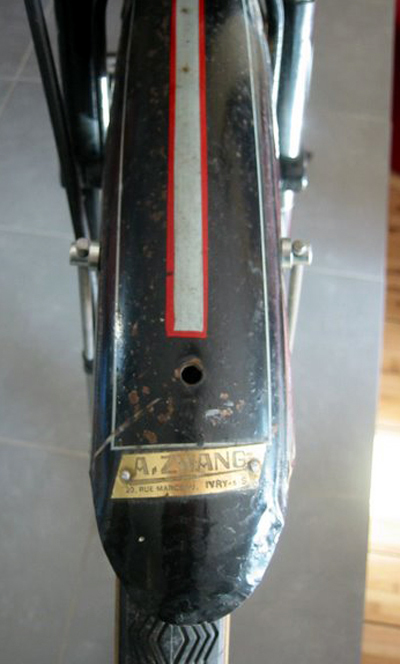 In its day, this machine would have been one of the most expensive cyclemotors you could buy. 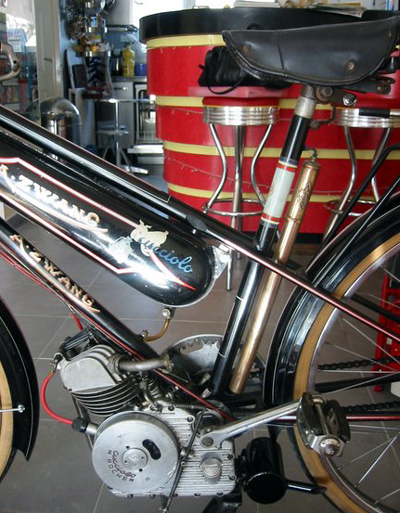 It was a bespoke creation and was the equivalent of the ‘Brough Superior’ of the cyclemotor world. There’s only a Channel physically separating us, but there’s more than language that differentiates the French and Brits. The national psyche is very different. 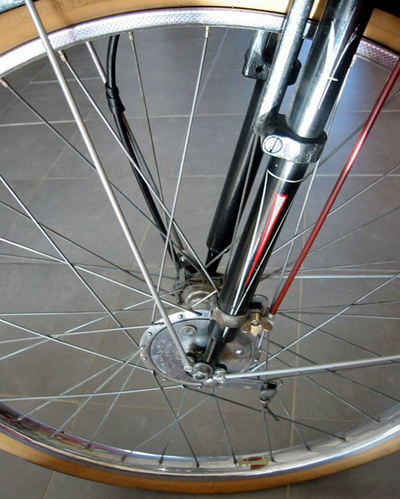 The top bicycle builders had a high status in French society. They considered their work to be a branch of French art and, therefore, were an integral part of the national culture. 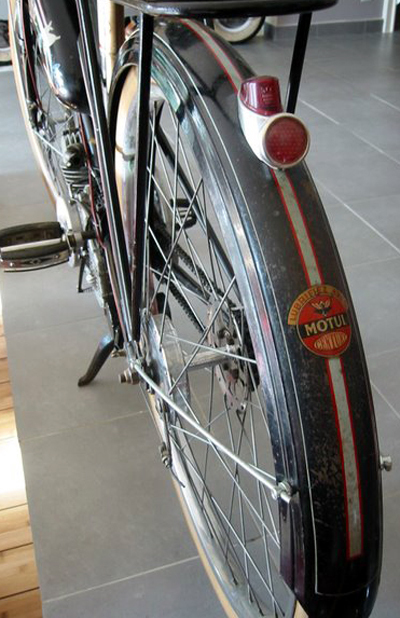 It’s interesting to note that although Great Britain was a leading manufacturer of bicycles, British marques have never achieved a similar status within our own national consciousness. 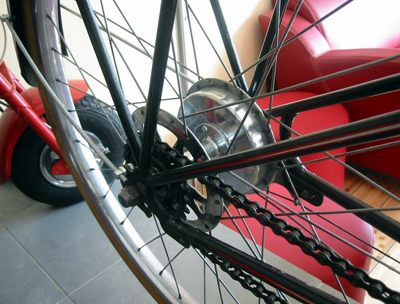 In France, everyone appreciated the top bike makers; the only comparison that comes to mind is the way that, here, we may revere film, music and football personalities. The top French fashion houses had a similar perspective; to the Haute Couturiers, their own creations were on a par with the great French artistic tradition. The top bike builders not only saw themselves in the same way, but they also considered themselves equal to the fashion houses. 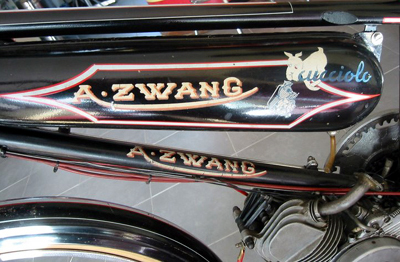 Indeed, both genres created their products from scratch: a constructeur such as A. Zwang would manufacture any component in-house to guarantee quality control, and each bicycle built was a bespoke service. 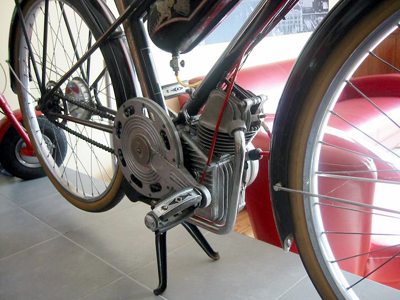 In the middle of WWII a designer named Aldo Farinelli developed the prototype of an auxiliary motor to be mounted on a bicycle. 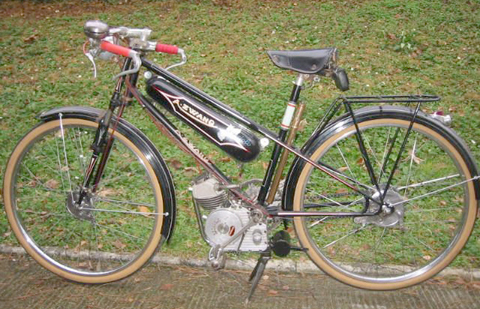 Farinelli’s design had a number of major advantages over the competition, above all its four-stroke cycle and two-speed gearing, which used the engine’s power to its fullest potential. [This was later known as the T1]. 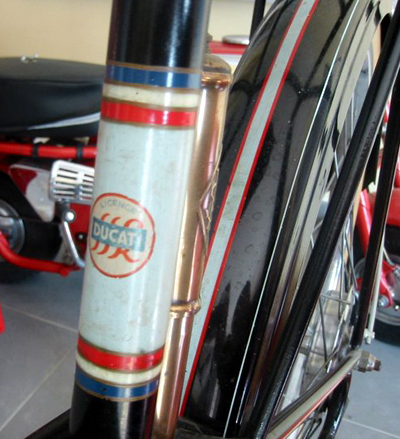 Ducati, which up until that time had produced radios and electrical components, partnered with another Italian firm, SIATA, to produce the Cucciolo, or ‘Puppy.’ By 1946, the rights to Cucciolo production had become exclusively Ducati’s. 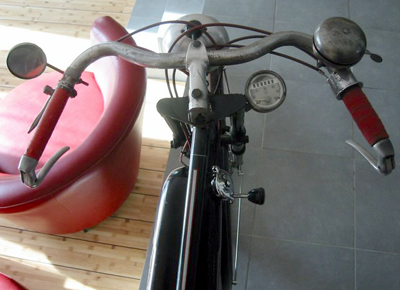 At the Online Cyclemaster Museum you can read more of the HISTORY OF CUCCIOLO. And I’ve also reproduced downloadable versions for you of the Cucciolo T2 Engine Illustration & Parts List (in French) and Cucciolo T50 handbook (in English). 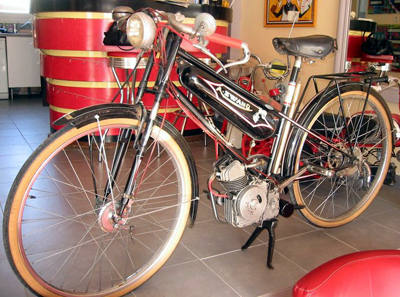 In France, Cucciolo engines were supplied by M. Rocher of Paris, who also made their own cucciolo-powered cyclemotors. 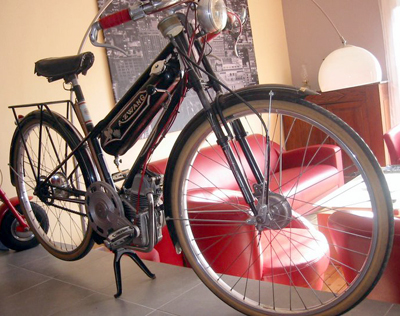 These are the approved dealers in France who were licensed to sell their bicycle or cyclemotor frames ready-supplied with Cucciolo engines from Rocher. This means that it is not my responsibility, but I can put you in touch with delivery people and organize collection; you liaise with them direct re delivery and pay them separately. Great Britain – delivery would be £50 to main parts of England; extra to extremities such as Scotland, Wales, Cornwall, etc (and may take longer to arrive). Please email your postcode if you want to confirm price. THIS BARGAIN PRICE DELIVERY IS ON A PART-LOAD BASIS. Collection when they’re in my area; delivery when in yours. If you want it fast, please organize your own collection. Europe – delivery is probably around €450 to Germany, Austria, France, Italy, etc. INTERNATIONAL PURCHASERS: You must communicate with me before the end of the auction to discuss payment and shipping options.